You may recall my post a few weeks ago about the Yo Gabba Gabba concert here in Toronto. Well, now I have the exciting pleasure to announce that one lucky Toronto Teacher Mom reader will win 4 tickets to the concert along with their CD jam packed with their popular tunes. Toronto, ON (January 19, 2010) - On the heels of the sold out YO GABBA GABBA! LIVE! : THERE’S A PARTY IN MY CITY! tour in Los Angeles, New York, Chicago and Dallas in late 2009,W!ldbrain, The Magic Store and tour producer S2BN Entertainment are bringing YO GABBA GABBA! LIVE! : THERE’S A PARTY IN MY CITY! to Toronto, ON on March 16th & 17th at 11AM & 3PM at the Elgin Theatre. In addition to the Toronto performances, YO GABBA GABBA! LIVE! : THERE’S A PARTY IN MY CITY! will be appearing in Minneapolis, Milwaukee, Fort Wayne, Cincinnati and St. Louis as a part of the 2010 tour. This state-of-the-art production featuring music, singing, dancing and animation is an interactive experience offering audience members of all ages the opportunity to witness their favorite characters come to life with the magic words, “Yo Gabba Gabba!.” Also joining DJ Lance and the characters on stage will be hip-hop legend Biz Markie to teach the kids how to beat box with Biz’s Beat of the Day as well as special guests The Aquabats, whose front man Christian Jacobs (aka the Bat Commander) is the co-creator of Yo Gabba Gabba!, for the Super Music Friends Show. Ticket are now on sale and can be purchased online at YoGabbaGabbaLive.com or through Ticketmaster. Tickets are $35 (plus $7.65 in fees when ordering from Ticketmaster). Gold Gabba VIP Party Packages are also available for $99 which will grant you premium seats, a meet-and-greet with the Yo Gabba Gabba! characters, a special entrance to the theatre, and much more. You can also buy tickets in person at the Elgin and Winter Garden Theatre Centre Box Office, 189 Yonge Street, north of Queen Street, across from the Eaton Centre. Box Office hours are: Tuesday to Saturday, 11am to 5pm, closed Sunday and Monday. To order by phone call Ticketmaster at 416-872-5555. There will be a $5.00 off discount for groups of 10 or more. Children under one year of age will be admitted free to sit on a parent’s lap. For additional entries, you may choose to do any or all of the following. Please leave a separate comment for each indicating what you have done. Blog about this giveaway with a link back to this post. When you are done, leave a link to your post in your comment. Become a fan of Toronto Teacher Mom on Facebook. Become a fan of Yo Gabba Gabba! on Facebook. Update your status on Facebook to notify your friends about this giveaway. Become a Yo Gabba Gabba! follower on Twitter. Contest ends February 28, 2010 at midnight EST. Open to residents in the Greater Toronto Area and neighbouring cities. Winner will be selected using Random.org and must reply to the notification email within 3 days or a new winner will be drawn. Tickets will be available at will call. I have been offered tickets for posting concert information. I was not compensated in any other way. The thoughts and views expressed in this post are strictly my own honest opinions. I love the Gabbamation Royal Blue Toddler Tee! Following via Twitter & Re-Tweeted! I'm goion for the Star Yellow Toddler Tee, it will be a perfect match to the yellow BackYardigans concert shirt my little girl got at the Ex this year. Love the toddler beanies @ the YGG show store! OMG! I am going to get 3 of them for my girls! I'm a Fan of YGG on Facebook already! The Natural Tote Bag would be great for taking my sons things to daycare, Think I'm going to grab one. I just updated your status on Facebook about this giveaway. I'm in love with the Yo Gabba Gabba Boombox t-shirt... Both for my daughter and me... We just ADORE Yo Gabba Gabba... The music is GREAT! We've also tweeted this too! Fan of Yo Gabba Gabba - CHECK! Just updated my status on facebook as well - CHECK! I love the Black Boombox tee! I like the natural tote bag! I like the toddler beanie! Fan of Yo Gabba Gabba on Facebook! I don't know how to add my name:) Boo-urns. But I have updated my Facebook status and have all fingers crossed! 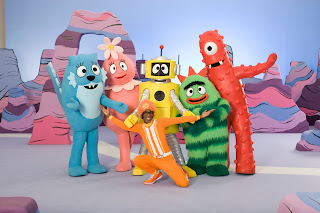 ..just became a fan of Yo Gabba Gabba in Facebook.. I went to the store and I actually plan to purchase the boombox black tee for my self and my husband also two charcoal toddler juvenile tees for my too kids. So when we win the tickets we will wear them!!!!!!!!!!!! just blogged about it check it out! I just updated my status on facebook!